I can only assume that part of the reason for this assignment is my residency in self-proclaimed Hockey Town. 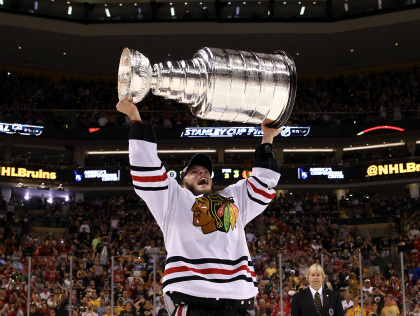 One would figure that the city is abuzz with hockey fans getting ready to crown a new champion. Truth be told though no one has said a word about hockey in Detroit since April 21st. And therein lies the most disappointing part about this year’s Stanley Cup Playoffs – they feel like they’ve been going on forever. In the West the glamor teams in Detroit and Chicago were dispatched with ease leading to a Nashville/Phoenix series that went 5 merciful quick games. The Los Angeles Kings finished the fairly meaningless regular season as an 8 seed but like a buzz-saw cut thru top seeded Vancouver, only to face a 5 day break followed by the 2 seed St. Louis Blues. The Blues fell even faster than Vancouver with the Kings sweeping a Blues team that looked utterly hapless for the series. You could have told me that L.A. won 5 games in the series and I would have believed it. And as a reward for dispatching the 1 and 2 seeds the Kings received another long break and a series against the 3 seed Coyotes. Again the Kings made it look easy, this time in 5 games dispatching the Coyotes leading to AN EIGHT DAY BREAK! As someone who watches an inordinate amount of hockey the scheduling for this off-season in the West was impossible. 1, 2, and 3 day breaks between series games meant that getting into a rhythm as an out-of-town follower was painful at best and severely adverse to living a normal life outside of Pacific Time . It only took 14 games for the Kings to get to Game 1 of the Stanley Cup Finals – but those 14 games took over 7 weeks from the end of the regular season. Certainly the Canucks, Blues, and Coyotes struggled with the timing but for the Kings they seemed immune to the breaks. 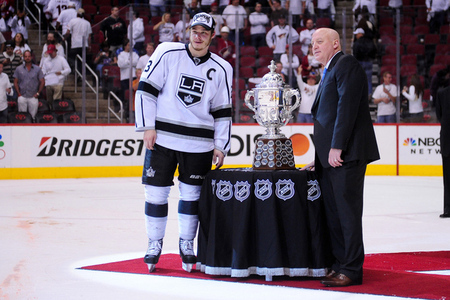 The NHL Stanley Cup Playoffs have provided excitement over the years and 2012 hasn’t been any different. Series after series we’ve been blessed with tightly contested action packed games. The Conference Semifinals get the 2nd round of playoff action underway tonight. There should be plenty of drama unfolding as rivals collide in the Eastern Conference while new talent finds it way to the top of the Western Conference. 9:52: It’s been a while since I’ve posted because I’ve been super busy with school. Tonight I thought why not give my running thoughts on the Phillies game, but other games that I’m watching. It’ll be mostly Phillies talk, with a little of MLB Network, NBA TV and NHL talk springled in. 9:54: Rangers win 1-0 to take a 2-1 series lead. Lundquist with a shut out. I didn’t get a chance to watch most of this game because of class, but I imagine he was awesome as usual. 9:58: The Caps get a power play because Dennis Seidenberg is an idiot. Does that mean we have to hear that stupid horn? 10:04- Lebron scored the final 17 points for the Heat in their comeback against Nets. That Bulls, Heat Eastern Conference Final is going to be fun. 10:05- Laich ties it up, 3-3 in DC. As Pierre says “A blown coverage.” You think? 10:14- I’m pretty sure Lincecum is going to throw a shut out tonight. Him and his ERA over 10 of course. 10:16- Wheels goes…He (Halladay) hasn’t blinked in a hour. haha oh Wheels. 10:19 HAHA that girl in the Phanatic hat. 1o:20- What were Pagan and Cabrera doing???? 10:23- Rollins walks? What’s going on? his second walk of the year. 10:25- Hunter looks bad on two swings, comes back with a RBI rope to center. Pagan bobbles it probably helps Polanco score. 10:26- Victorino RBI single to make it 2-0. Wheels can’t get over how deep Pagan is playing in center. 10:28- LOL Laynce Nix 2 run double. 10:31- Those New York Life promos when a runner gets to a base has to stop. It makes my ears bleed. 10:32- 30 pitch inning for Lincecum as he strikes out Galvis to end the inning. Boy, he got no help from his defense. 10:35- Haha lefties are hitting .080 against Doc. He’s been great this year in his two starts. He just won his 190th game. Hall of Famer? A few more years like the last two years, I say yes. 10:38- Of course after my glowing post on Halladay, he gives up a hit and a walk to start the game. Luckily Sandoval hits a bullet right to Galvis for Out #1. 10:40- Posey’s infield single loads the bases for the Giants. No chance for Rollins to get the runner at second. 10:41- Sac Fly for Aubrey Huff. I really dislike him. Need a reason? 2010 NLCS. 10:44- Belt walks, sets up a bases loaded situation for Brandon Crawford, who’s not a good hitter. 10:45- Halladay makes Crawford look really bad. 4-1 after 1. 10:49- Sharks and Blues tied at 1. Hitchcock did a great job turning around the Blues. I dislike Niemi for the Stanley Cup win against the Flyers. Niemi was bad, Leighton was worse. 10:51- So this is the point where Lincecum and Halladay settle down and this game ends at 12:30 right? 10:52- So Ike Davis homered for the second straight night. Looks he’s finally going to turn it around. 10:53- Verlander throws 100 MPH on pitch 122 in the 9th. Wow. The only one better than Doc at this point. 10:55- looks like I was right. Halladay has a 7 pitch inning, Lincecum had a 1,2,3 inning. 10:56- Kendry Morales hit his first home run since he messed up his ankle during a walk off celebration. Morales was an excellent player before the injury. 10:57- Filthy changeup by Lincecum to strike out Rollins. 11:00- Lincecum loses control of a fastball that makes Pence fall to the ground. Hunter was not a happy camper. 11:07- Halladay allows a single to Buster Posey, who’s a monster, but retires the side. Doc has retired six of the last seven hitters since the first inning. 11:11- Oh now. Sarge time. Any guess what my wish at 11:11 was? 111:13- First Tom McCarthy “How about that?” of the game comes after Halladay knocks in Galvis to make 5-1. 11:15- Speaking of Galvis, He’s 7 for his last 18. I don’t have high expectations for his hitting ability, but job well done sir. 11:22- Lincecum hits a roller to third that scores a run. Damn. 5-2. 11:25- Pagan hits a rocket to the wall, but Pence makes a great catch to end the inning. 11:29- Phillies getting awful swings on Lincecum’s changeup as Polanco is his 5th strikeout victim. Such a great out pitch. 11:34- Sarges says you need three center fielders to play the outfield at AT and T Park, guess he doesn’t remember that Pat Burrell won a title with them? 11:37- Thunder up 8 over the Clippers. The Clippers broadcast brought up that Chris Paul was booed at the Dodgers game. Seems odd, but I guess Dodgers fans are mostly Lakers fans? 11:39- I like Gregg Murphy, but the sideline reporter needs to go. Too many voices. It’s almost like the Phillies feel that more voices are better. The reason that Harry was so great was because he didn’t talk all the time. 11:40- Sandoval hits a ball that hits the first base bag, Doc’s gotten a little unlucky tonight. 11:44- Doc is not a fan of home plate umpire Marty Foster. 11:46- Illinois’ Spring Game is on the Big Ten Network in case you were interested. You weren’t? Thought so. 11:46- Geraldo Parra hits a ball into the Hot Tub in Arizona. Luckily no one was in it at the time. 11:52- Everything is at a commerical. First time all night. 11:52- Spurs up 21 over the Warriors. The Warriors sure know how to tank since Monta left. 11:56- Nate Schierholtz pinch hits for Lincecum and flies out to end the 6th inning. Halladay’s 9 pitch inning puts him at 94 and likely gives him one more inning. 11:59- Dan Otero in the game for the Giants. No relation to Phillie great, Ricky Otero. 12:01- Polanco gets hit in the elbow. Let injury filled season begin. 12:05- Wheeler steals my Rickey Otero line. Interesting fact- He was the first batter ever at Waterfront Park in Trenton, NJ. 12:06- I know, way too much Rickey Otero talk. 12:11- Triple overtime for Dallas and Utah. 12:11- Serge Ibaka barely hits the rim on a free throw. Hits the back rim on the second foul shot. Stick to blocking shots bro. 12:14- Because Aubrey Huff stinks as an outfielder, Crawford drops a pop up. 12:15- Wheels all sorts of the confused on what’s a hit and an error. 12:16- Doc bats in the 8th inning, so he’ll likely pitch the 8th inning with 100 pitches. 12:21- Huff pops out for the first out of the 8th inning, crowd boos. He’s been brutal since the 2010 season. 12:23- After Posey reaches, Halladay makes Huff, Belt and Crawford look silly. He’s done after 8, 109 pitches and 76 strikes. Wow. 12:27- According to Matt Gelb, Halladay threw 24 pitches from 6th-8th inning. Dominant indeed. Meanwhile, John Mayberry Jr. takes a called third strike, brutal start of the season for him. 12:31- Papelbon for the save…. 12:36- Gregor Blanco batting for the Giants. Former Brave who wasn’t very good. I remember going to a Phillies/Braves game a few years ago and he was egging on some fans. He’s a clown. 12:42- Victory! Phillies win 5-2. Halladay the winner, Lincecum the loser, Papelbon the save. If you like what you read, I’ll be doing tomorrow. I’d stay up for the Thunder, Clippers game, but I got to get up to do some homework. Night folks!